Posted on November 9, 2016 at 5:30 am. 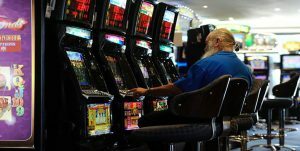 As Senator Nick Xenophon’s Pokie-Leaks gathers steam, pokies venues across the state have been threatened by protestors who claim they want to warn punters about the potential dangers of gaming machines. Protestors have threatened to storm gaming venues and wrap pokie machines in danger tape. They have declared no venue is safe, and appear to have no regard for the thousands of employees and independently-run venues that, by law, are required to list the dangers of gambling on machines. West Footscray teacher Lyndall Judd, 32, told The Herald Sun that she was joining the campaign after seeing her students affected by their parents’ gambling problems. She became a registered teacher only a few weeks ago, on October 12. “It is time for the government to stop its addiction to the tax revenue and look after its communities,” she said. On her publicly-accessible Facebook page, Ms Judd calls for a $1 betting minimum on all pokie machines. “These machines are designed to be addictive and cause massive financial stress that leads to family breakdown, crime, job loss, depression, and suicide,” she said. The protestors are calling for Crown Casino and other pokie venues to remove gaming manufacturer Aristocrat’s “Dolphin Treasure” game from the floor. Reverend Tim Costello from the Alliance For Gambling Reform said his group was not involved in the campaign but that he understood the motives behind it. This is despite a recent event organised by the group and the Victoria Greens that offered training to anyone who wanted to be involved in “peaceful” protesting against pokies. It appears, however, that the radical protestors intend on ransacking privately-owned businesses, which appears to be the opposite of “peaceful”. The time is impeccable – and suspiciously convenient – with Senator Xenophon pushing for tighter restrictions on gaming machines, and Crown casino embroiled in a court case alongside gaming machine manufacturer Aristocrat as they fight claims that they knowingly create and manage deceptive pokie machines. If you’d like to try playing pokies online and avoid the dramas of the Pokies Leaks campaign, there are plenty of online casinos available to players from United States. We highly recommend Bovada Casino as the safest and best online casino providing support for players from United States.